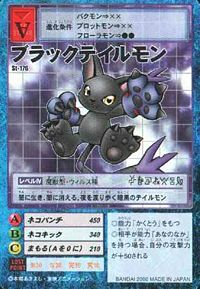 A Virus attribute Tailmon who sports vivid, pitch-black fur. A child completely born of evil, it lives its life treading through the ominous darkness. 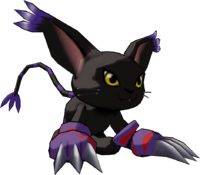 Black Tailmon is a variety of Tailmon that is born very rarely, and as such is said to have a low population size. 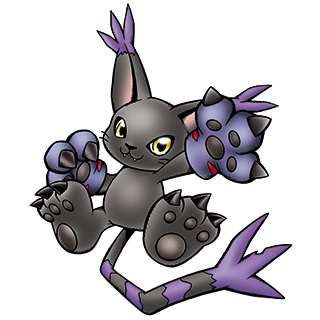 It has a mean and prideful personality, and is a problematic Digimon that loves picking on the weak. 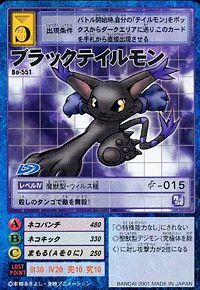 It is a dark-type Digimon that generally evolves into Fallen Angel Digimon. Its Special Move is Neko Punch, the same as Tailmon's. 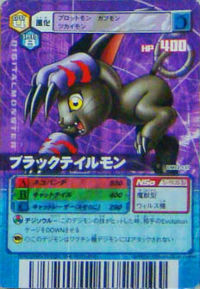 A Virus attribute Tailmon who sports vivid, pitch-black fur. A child completely born of evil, it lives its life treading through the ominous darkness. Black Tailmon is a variety of Tailmon that is born very rarely, and as such is said to have a low population size. 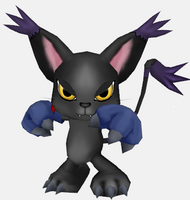 It has a mean and prideful personality, and is a problematic Digimon that loves picking on the weak. 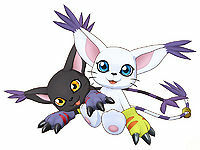 It is a dark-type Digimon that generally evolves into Fallen Angel Digimon. 1) n., Something that is colored black. 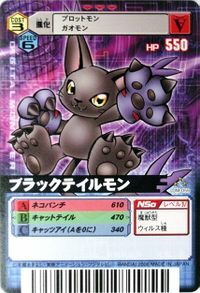 Neko Punch  Cat Punch ネコパンチ Neko Panchi Lightning Paw Punches at the enemy with its powerful claws at lightning speed. Neko Kick  Cat Kick ネコキック Neko Kikku Lightning Kick A super-fast flying kick attack. 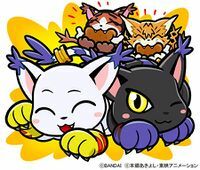 キャッツ・アイ Kyattsu Ai Cat's Eye Hypnotism/Cat's Eyes Hypnotizes the enemy with mysterious power from its eyes. デンジャーラブ Denjā Rabu Dangerous Love Curses the enemy with a heart-like charm. 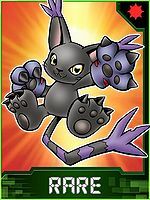 Black Tailmon is an obtainable Black Card. However, it is a Child card. Black Tailmon is an obtainable evolution of Piyomon. Black Tailmon is an unobtainable enemy Digimon. It can only be obtained as a collectible card. 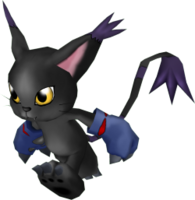 Black Tailmon can be encountered in Powdery Cliff, where it awaits a frozen flower to melt. Once its problem is solved, it will join the Village of Beginnings as one of the chefs in the Restaurant, selling cold dishes at night time. Evolves form Patamon, Terriermon or Impmon. Can evolve to Holy Angemon, Bastemon, Neo Devimon or Lady Devimon. 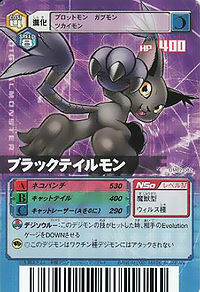 It lives in the darkness and disappears into the darkness, a black Tailmon who walks the night. It dances a tango of death with the enemy! The night is its stage! This Tailmon of darkness dances swiftly and adorably!